Under blue skies the gates of Kempton Park opened to the hoards of dealers, collectors, stylists, yummy mummies and visitors from a far for the Sunbury Antiques Market. 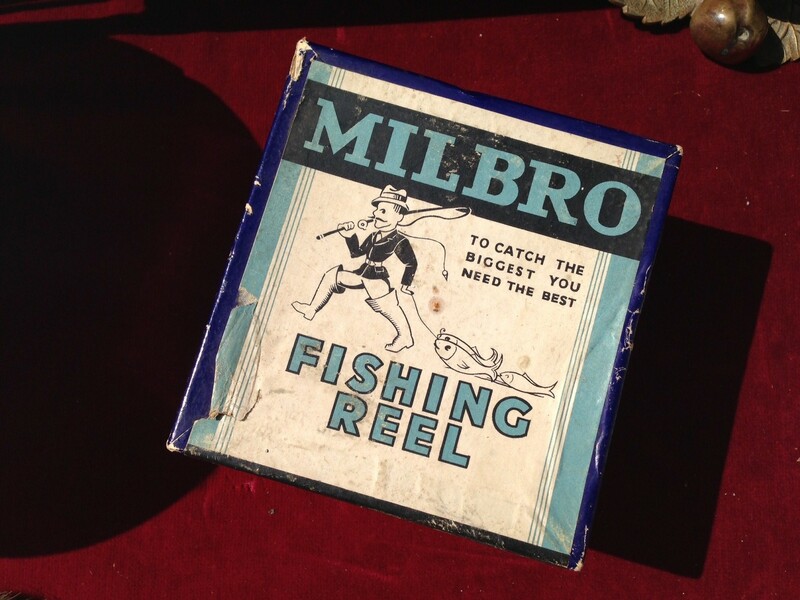 On a stand close to the entrance I found a Milbro Reel box with its retro graphics in clean order printed in blue and black on a white card background. Within the box was an Allcock Stanley Reel, this was a first for me. 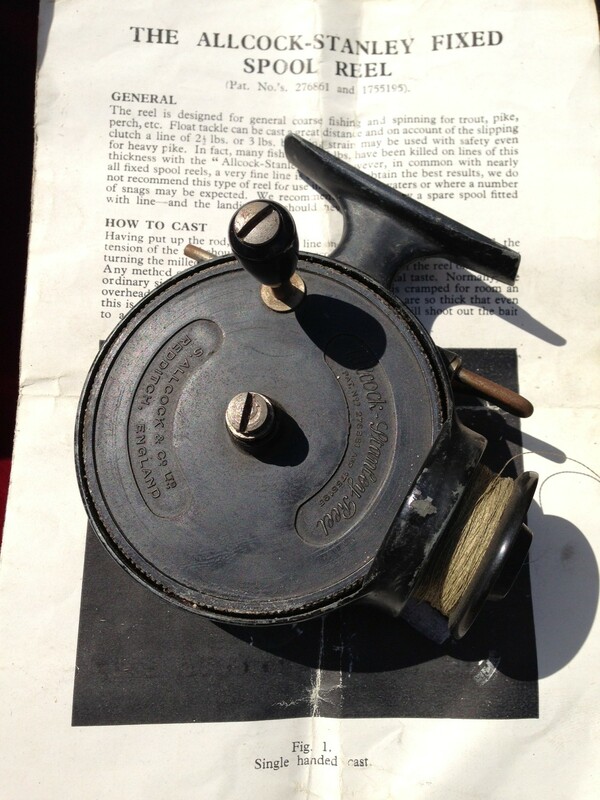 The reel was in good condition and came with its original leaflet. Its design seemed somewhat cumbersome but a great piece of engineering. Earlier I had found a few K. P. Morritts reels,a couple of Eaton Sun reels, various pike bungs, a mounted pike head, the usual landing nets and a Holmes three-piece cane rod. 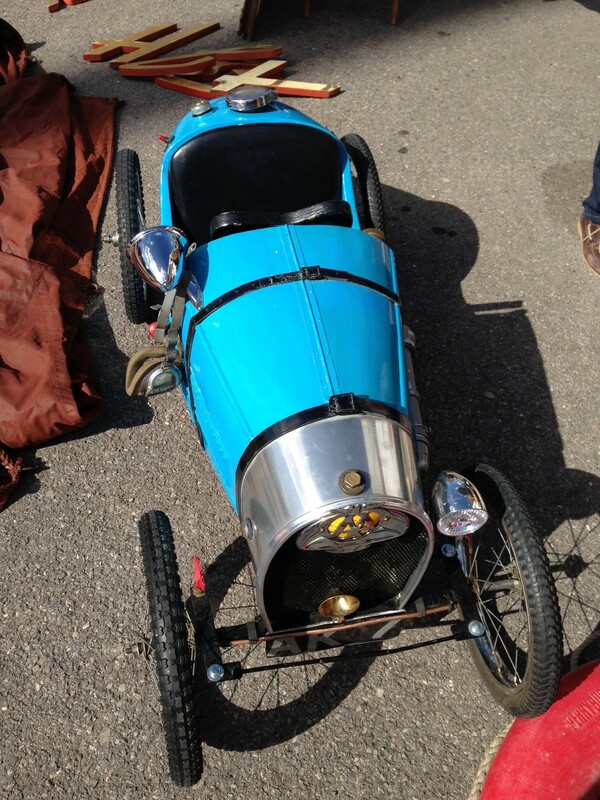 Found at Sunbury Antiques Market a Type 35 Bugatti pedal car. Tonight there is a gathering of the Caught By The River Social Club at The Queens Head at the back of Piccadilly, where readings,verse, pictures and film will be spoken and viewed, I hope to be there. Found over the other side of the Seven Bridge a Orvis Battenkill Multiplier 5/6# reel. The Orvis Battenkill is a well made and robust reel if slightly heavier than my prefered Hardy Lightweight range but all the same will perform well. It’s slightly heavier feel will balance well with my Hardy Perfection 8 1/2 ft 5# cane rod. 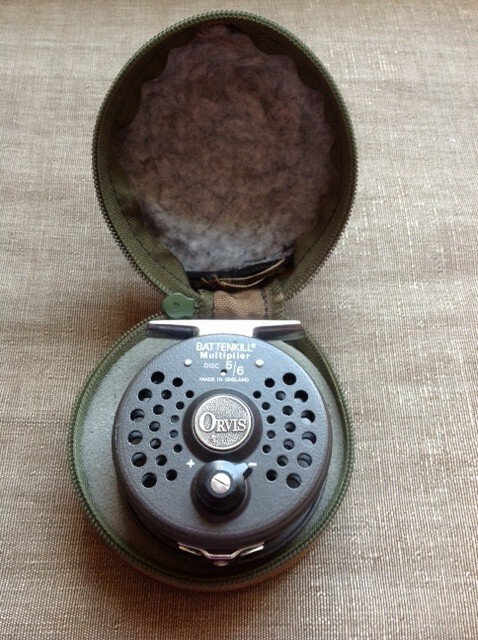 This is the only Orvis reel I have owned and is now quite a rare find especially in this condition. Beverley Brook cuts a path through Barnes Common in Southwest London. For many years I have been interested in the hidden rivers of London and the Home Counties. Their paths just etched marks across fields and many just lined culverts through housing estates, industrial sites municipal recreational grounds, car parks and waste land. Rivers that once flowed through the City are now underground with their final flow into the Thames through grids and outflow pipes. 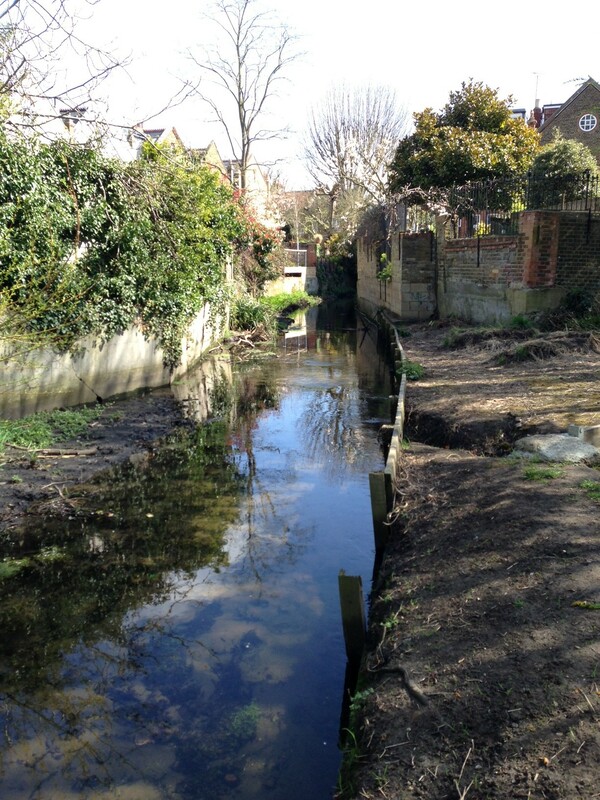 One of these small rivers cuts through the Lion Estate in Barnes across the playing fields at Rocks Lane and flows past the Wetland Centre and out into the Thames near Putney, this is a stream known as Beverley Brook. As the stream passes through Richmond Park it holds a good head of chub and other silver fish, however these fish never seem to migrate further downstream via the allotments near Palewell Park or Priory Bridge and into the slow flowing reach at the back of Barnes Common, well not until now. 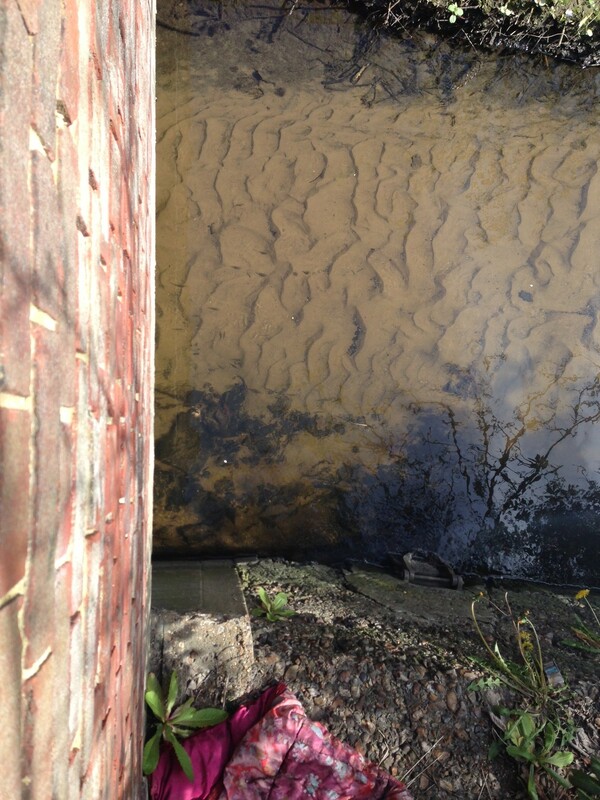 On walking back from the railway station I took time to look over the bridge that allows the stream to flow under Station Road, there in the bright sunlight against the silt bottom I noticed some small fish about an inch long, some slightly larger. Clearly there has been some work done on Beverley Brook so is this part of a new stocking program or that with the heavy winter rains that new life has been brought back to the Brook. 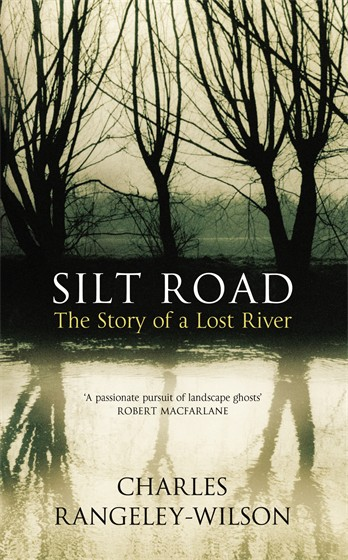 With the recent publication of the Silt Road by Charles Rangeley-Wilson I hope this will nurture more interest in these silent arteries of our land. 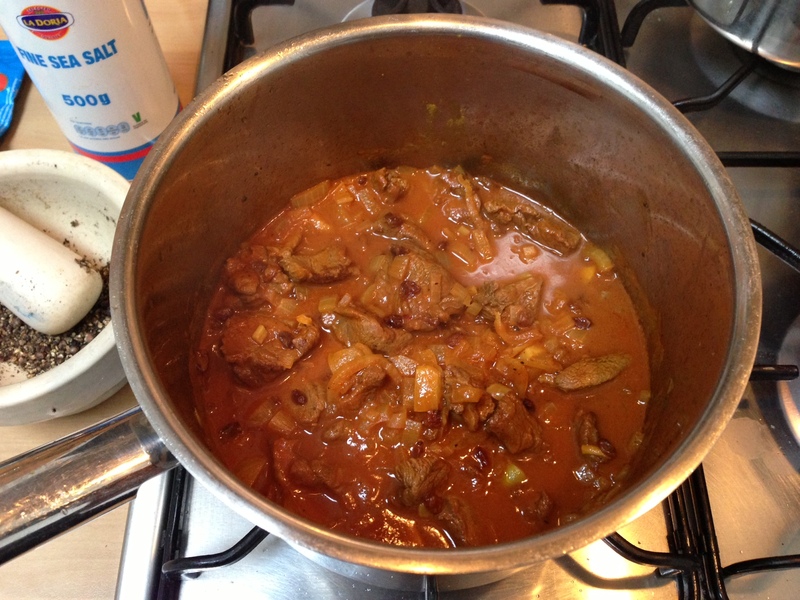 Venison and rhubarb stew…Persian style. With the blossom out on the trees, spring shoots in the garden and boxes of fresh rhubarb outside the greengrocer my thoughts turned to a great Persian recipe which is a classic and made usually with spring lamb and rhubarb. My dear friend Chris Norcott, of Winterbourne Game gave me some diced venison at the weekend along with a Orvis branded plastic tub full of dry flies, these beautifully tied by Brian Cleverton. 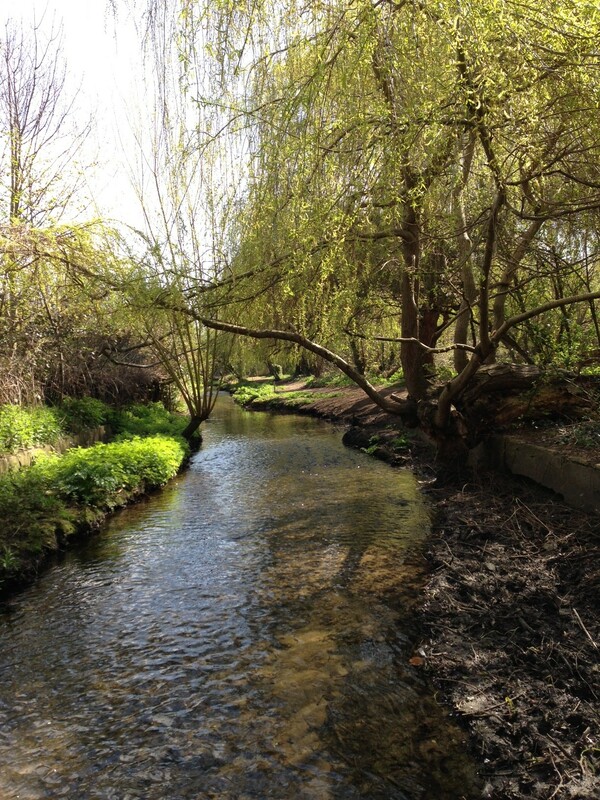 Chris had an early season treat of a day on the Test, that mecca of a Hampshire chalk stream. Fishing was reported to be hard, the water at least a foot and a half higher than expected for this time of year and full of colour, even so a few trout were had that day and I hear one of their fishing companions had managed to catch a trout, sea-trout and salmon in a single day…that is what dreams are made of. Well, back to the venison and rhubarb stew, a hearty meal with full flavours. Firstly cook down two medium-sized, finely chopped onions in some olive oil. If using lamb dice a couple of neck fillets or leg of lamb. For this recipe I’m using venison which is much leaner. Fry the venison on a medium heat in some good olive oil until browned all over. Add a tea-spoon of turmeric, 3 cloves, freshly ground black pepper, add some barberries, mix well, then add two-thirds of a cup of water, enough to cover the meat. After 20 minutes add a good table-spoon of tomato puree. Continue to cook over a low heat for an hour and a half. Whilst the stew is cooking, wash and soak the basmati or long grain rice, I cook a cupful of rice to two cups of water and place in a steamer and lightly salt. I use a Cusinart Rice Steamer and Tilda Basmati, it gives perfect results time and time again. 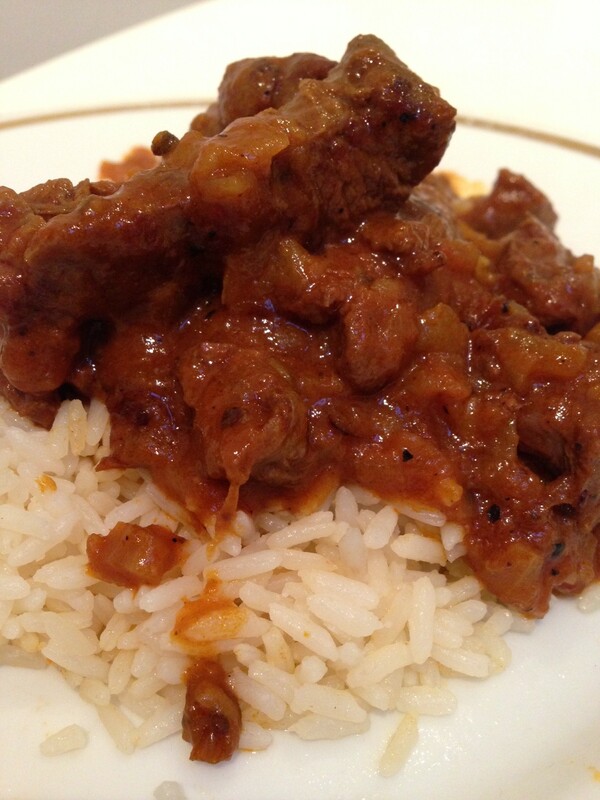 A classic Persian dish but made with venison instead of lamb, Venison and Rhubarb stew with a twist. About 15 minutes before serving add the new season pink rhubarb, cut into inch chunks. Cook the rhubarb but don’t let it cook down into a mush. Venison and Rhubarb Stew, from the Tales Kitchen. Serve with a small knob of butter on the rice and a perfect red wine to serve with it is a Bordeaux, I chose a 2008 Chateau Les Arqueys from Lea & Sandeman, it had good depth and tannins, rich spice and an earthiness which compliments the dish. 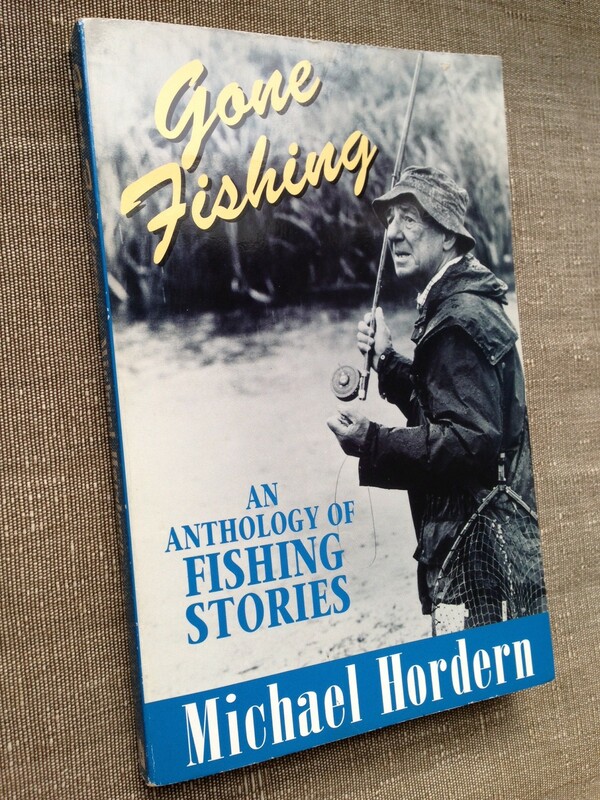 A recent visit to a charity shop resulted in a couple of vintage book finds, these being a copy of Gone Fishing – An Anthology of Fishing Stories by the renound actor and fisherman, Sir Michael Hordern who as played everything from Toad of Toad Hall to Lear. Gone Fishing includes stories by Hemingway, H.E. Bates, H. Plunket Green, George Orwell, Norman Maclean, Raymond Carver , John Buchan and Arthur Ransome. Also included in the book is the poem by Rupert Brooke written in 1911, The Fish. Brooke who is recognised as the great poet of World War I was also a countryman. Gone Fishing was first published in hardback in 1995 the year of my first-born who hasn’t taken up the art of angling unlike his younger half-brother who seems to have it in his blood. The other book found was a copy of Thelwell’s Compleat Tangler that was first published in 1967, which is an illustrated and well observed account of the fisherman. Thelwell lived in a cottage on the River Test in Hampshire, his observation of both fluff chuckers and coarse fisherman is so true, very little if anything has changed in over four decades. So many of us fisherman will end up fighing with a tree, will pack enough kit for a days fishing that it would have challenged Scott, Shackleton, Burton and Speke for any expedition. I missed the stalling out of John Andrew’s at Farlow’s earlier in the week, an event that I wanted to be at and much in the same way that I wanted to visit the Fulmer Library in Bucks to listen to the spoken words of Charles Rangeley-Wilson of the Silt Road, Unfortunately my time this week was taken up preparing to embark on a new project that would take me away across Flanders fields to the lowlands of Holland. However, delivered in a small cardboard box a pair of Farlow’s Serpent 3 1/2 inch fly reels. Made to a similar standard and in the same colours. 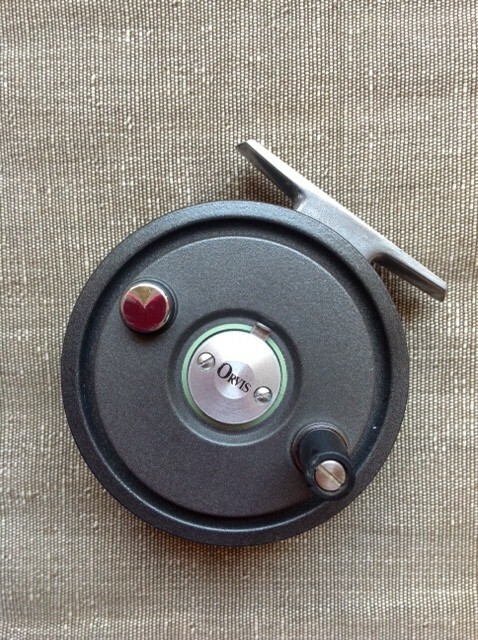 The fishing reel’s finish is stove-enamelled, with a gun-metal cage and matt silver spool. The Hardy Lightweight series have been produced since the mid 30’s and are a reliable and robust reel, light enough to marry with any modern composite carbon rod. The only real difference is the missing feature of the adjustable check however it does have chrome plated line guard rather than the nickle silver found on the Hardy Lightweight reel series. 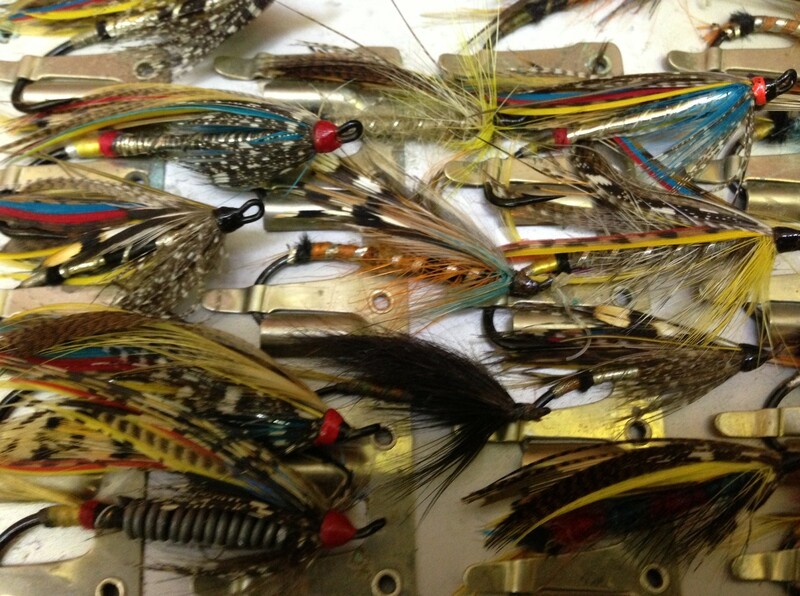 I ‘ll use these Farlow’s Serpents for sea-trout fishing on the Welsh rivers later in the year. 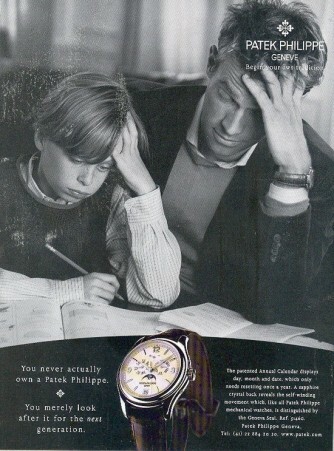 Patek Philippe advert father and son. I read an article today in the most recent May issue of Trout & Salmon that one of the most important purchases of any fly-fisher is the quality of the reel they will use, if you buy the right one it will last you a lifetime much like the Patek Philippe watch advert that states that, ‘You never actually own a Patek Philippe. You merely look after it for the next generation’. This also applies to coarse fishing for those that buy a Chris Lythe, Edward Barder or Allcock’s Aerial or any other hand-made centrepin. 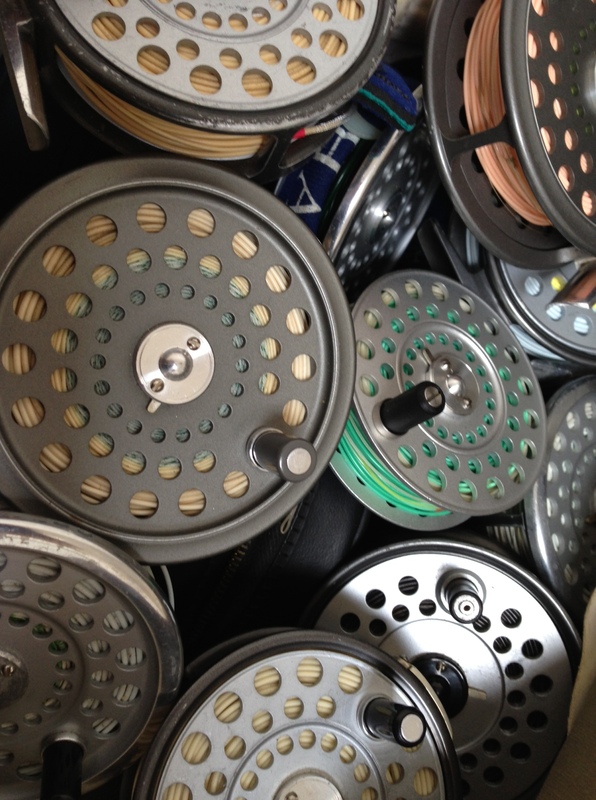 Over the years I have collected many reels, each has a purpose and each was a considered purchase, new or second-hand they have been cherished and will be handed down to the next generation to be fished with and some have already been fished with by young Tales. Most of my reels are lightweight Hardy reels, some LRH Lightweight, Marquis, Viscount 130 and 140, Ultralite and Ultralite Disc plus a couple of Farlow’s early 60’s versions of the Hardy Princess, this being labled by Farlow’s as the Serpent at 3.5 inch light alloy spool reel with line guard and adjustable tensioner good for sea-trout fishing with a #7 line. A good second-hand Hardy LRH Lightweight Reel, boxed with papers will set you back about £120, £60-80 unboxed on eBay and spools £20. 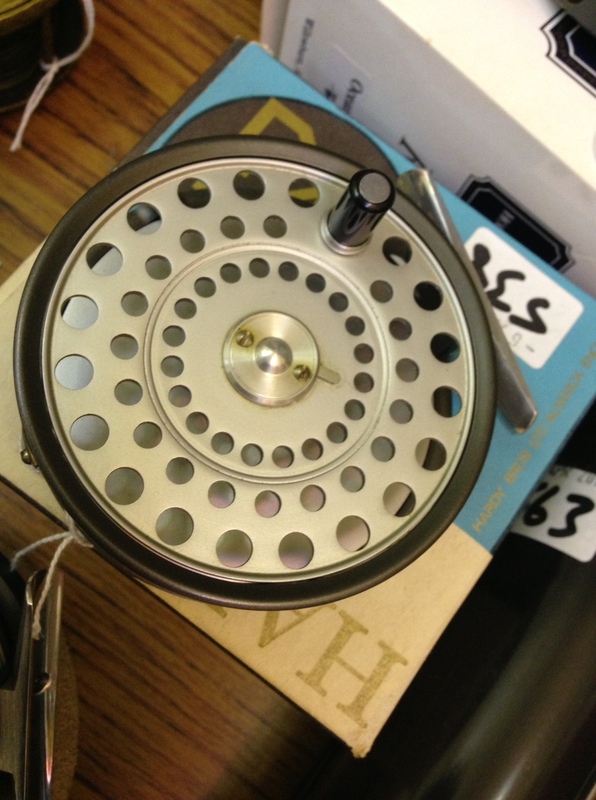 A Farlow’s 3 inch equilvelent you may pick up for £45 or an Orvis Battenkill reel for £50. 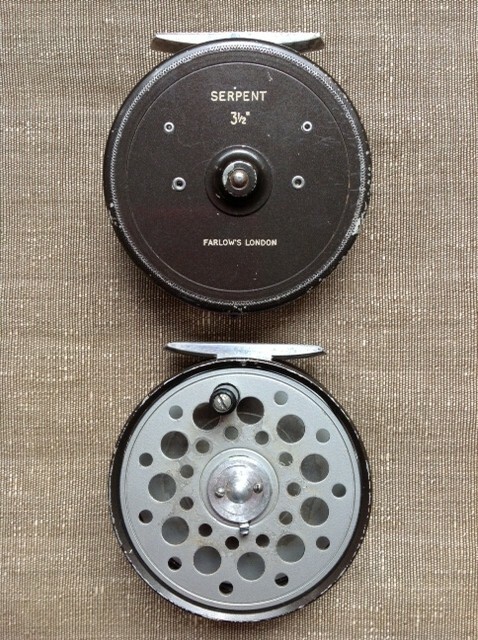 Online action sites are a source to find second had reels, some are in good condition but you’ll probably find there is not much in it to buy from a vintage tackle dealer and at auction a Hardy LRH Lightweight, Princess or St Aiden will probably be yours when the hammer knocks at £70. What I have come to realise is that a good quality reel becomes an extension of the family, a dependable friend and keepsake. Whilst rods change rapidly and have done with the advance in composite technology reels have come on but a vintage reel is still sought after. It was my wife that questioned as to why I owned so many, three in her mind was more than enough and one for light rivers, one for sea-trout and one for salmon with the understanding that I may need a couple of spools for different lines – however, on looking in my trout bag it was noted that I had several of the same reel, these being my favourite the Hardy LRH Lightweight a reel I have used for every season and most outings. One reel I would like is the Hardy Featherweight only to marry to a 7ft #4 rod I will use this year for small chalk stream fishing for trout or for fishing for roach, chub and dace on some backwaters of the Thames when the season gets underway in a few months. I did witness last year a huge rise one evening on the Thames where dace and other silver fish were taking storm flies from the surface film. Your choice of rods may change but a good quality dependable ‘cotton reel as my wife refers to’ will last you and your children a lifetime. The Silt Road I know so well.. I can’t wait to get a copy of Charles Rangeley-Wilson’s new book the Silt Road, the story of a lost river. A chalk stream that rises in a copse much like the River Chess from a spring in Pednor, a small stream I played in, fished and watched nature unfold as a child. Wagtails and kingfishers and the occasional mink. This story charts the course of a river and the history that unfolds from its source to where it disappears under car parks and streets, where it once gave life to the town. Much of what I have read so far about the book is mirrored in my own life from my childhood experiences. There were two streams that I would fish for trout in, the River Chess and the River Misbourne both start as trickling streams one from a copse and the other from a field and run their course in the Chiltern Hills and off to places I never knew, for me once the river disappeared from view it had gone. There was another stream the Wye but I seldom ventured over the hill to the Hughenden Valley. In the book the Silt Road it refers to Chairmakers who die of fever, these are the Chairmakers in Hampden Woods, the wood that are close to my parents home where I would find their rotting tools in the undergrowth and the earth works that would be the only indication of their existence. So much of the essence of this book I can relate to. The stream that runs from the back of Radnage through semi industrial High Wycombe where furniture making was its main craft. The River Wye cuts through the Hughenden Valley in through Hughenden Manor once the home of Disraeli, the former British Prime Minister. The Wye flows through the town via Bourne End and into the Thames. The Wye is the other important Chiltern chalk stream. The River Chess runs from the back of Chesham through the town where it meanders behind cottages and onto open meadows via Latimer where once a 1st Century Roman Villa stood on its banks across meadow land to Chenies then onto Sarrat. However the Misbourne appeared to come from a spring in a field that fed a small lake in a field that in some years disappeared completely and when running twisted its way through Little Missenden to Old Amersham where it once ran in front of a Roman Villa and then again runs behind small brick and flint cottages onto the memorial park until it drop out of view. It passes through towns where it was once used to throw bottles and waste into. It passes industrial plants, gas works then under the London Road to Chalfont St Giles then the pastoral plains of Chalfont St Peter. The Misbourne then runs into the River Colne ,you will end up driving over it if you use the M40 to drive into London, ultimately the Colne feeds into the Thames. Whilst searching the foreshore for more ceramic shards for my project Words In Water I found a complete fossilised sea urchin. I have found similar on Brighton Beach and a couple in the soil on Chorleywood Common as a child. Going back to the Silt Road I am still fascinated by the finds in the silt and sand of the Thames. Each and every item has had a purpose and has been handled by lost souls. Within the Thames I have found Saxon fish traps and bones tools, Medieval jugs and floor tiles where many a foot has trodden, clay pipes from the brewery workers and shipwrights, coins dropped by the ferryman, porcelain dolls from Victorian children, numerous ceramic shards of plates, bottles and jars of which the brands are long gone but their soul still remains. Buttons from service men and of items vintage fishing tackle such as spiral Wye weights and bait droppers. At approximately 1.30pm the doors of Chiswick Town Hall in west London opened in order to allow viewing of the Angling Auction that will take place tomorrow. There was much to view, in fact too much to list but it covered rods, reels, fly boxes, priests, stuffed fish, oil paintings, bronze sculptures of game fish, eel forks, bags and fishing collectables, it was an Aladdin’s Cave. Had finances been better I would be there tomorrow, there was much I would bid on. 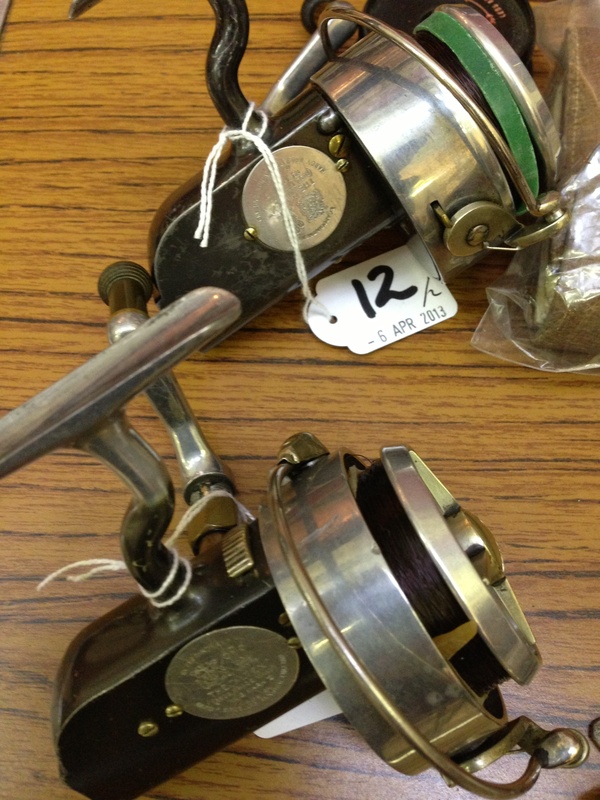 A fine Hardy Princess Reel plus several fine Hardy Altex fixed spool reels. 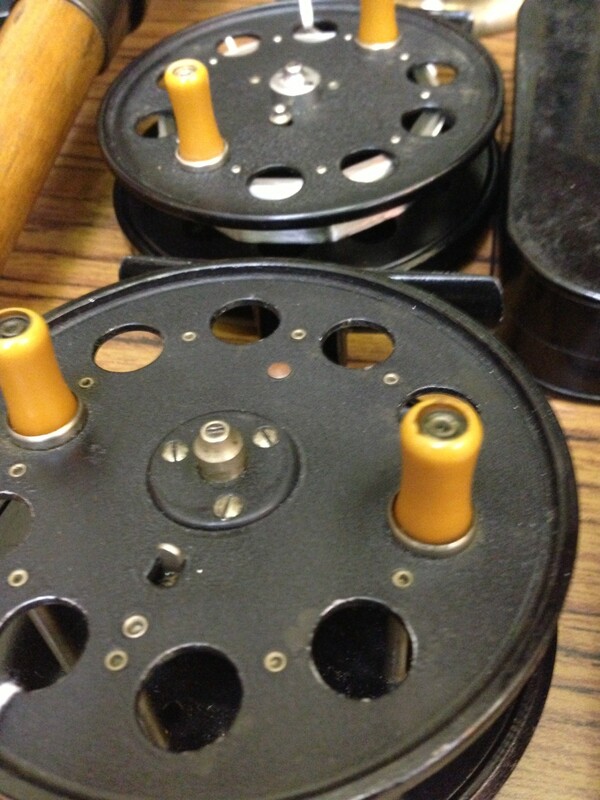 I saw a fine Hardy Ultralite Salmon Reel with spare spools loaded with new lines, also in the same section was a selection of mint condition Hardy JLH Ultralite Reels. Cane rods were displayed along with rod bags, rod boxes and rod tubes. The honey coloured cane produced a warmth from inside me, I could just feel that summer evening warmth and sense that emerging dun. For the coarse fisherman there were several fine B James Avon Perfection and Avocet rods plus a couple of mint WR Speedia reels. If you are a fisherman you need to be there, you wont be disappointed but the wife may have something to say about the bank balance come Monday…go on make a bid or two. Late this afternoon I took a walk along the river whilst the tide was out. A bitterly cold wind blew in from the East which was accompanied with intermittent snow showers. The tide was on the turn yet the wind was creating white horses as waves started to form and turn over. The recent high Spring tides and force of the water has turned over the shore, silt has been washed away and the shards of time are being drawn to the surface. Each shard of pottery is a reminder of our past. The dominant fragments are stoneware, blue-on-white porcelain, Willow Ware, terracotta and the occasional medieval floor tile or Bellarmine jugs. What does fascinate me is the amount of stoneware and ceramics detailing type or embossed branding. These words in water give us a clue as to what the pot, bottle or item of ceramic or glass for that matter was used for. I managed to collect a good bag of shards, Dundee Marmalade jars, bone marrow jars, porcelain with makers stamps and marks, ginger beer bottles, stoneware ale bottle from Burton and other unidentified ceramics. 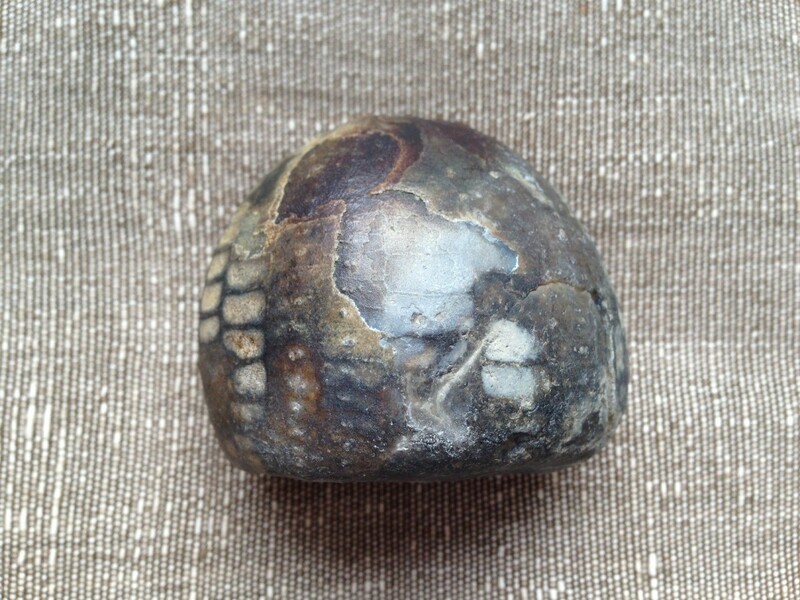 Over the next few days I will put together a collage of my finds. I may just have enough characters and fragments of words to make a poignant line or two about the Thames, this artery of life and London.